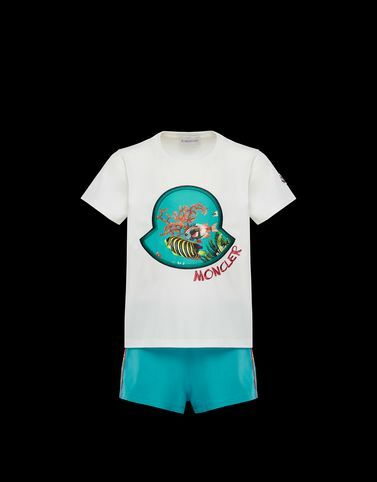 This Moncler t-shirt and shorts set will allow the most style-conscious girls to let their imagination run free: the playful ocean floor print enlivens this outfit, designed to bring joy to every moment of a fantastic summer day. PART A: Wash max 30°C - Mild process; Do not bleach; Do not tumble dry; Ironing maximum temperature 110°C - without steam; Do not dry clean; Professional wet cleaning - mild process; Dry flat; Wash separately; It is advisable to wash and iron the garment on reverse. ; Do not iron printed part;PART B: Wash max 30°C - Mild process; Do not bleach; Do not tumble dry; Ironing maximum temperature 110°C - without steam; Do not dry clean; Professional wet cleaning - mild process; Dry flat; Wash separately; It is advisable to wash and iron the garment on reverse.